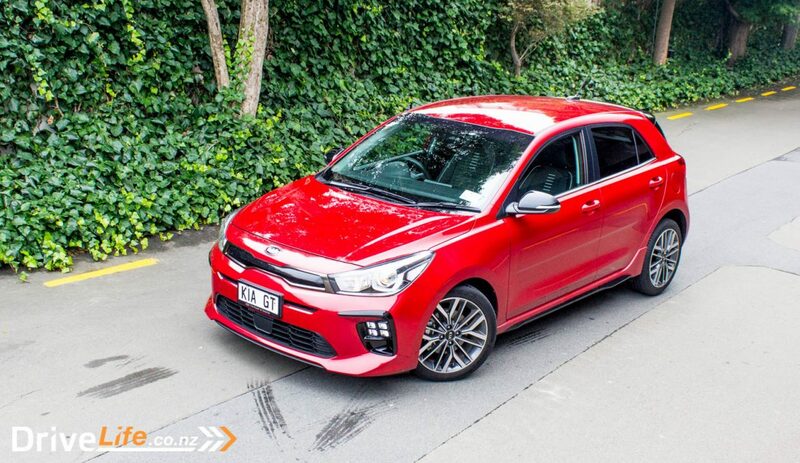 There’s a new Kia Rio in town, and at last it’s got some guts to go with the looks – and it needed it. 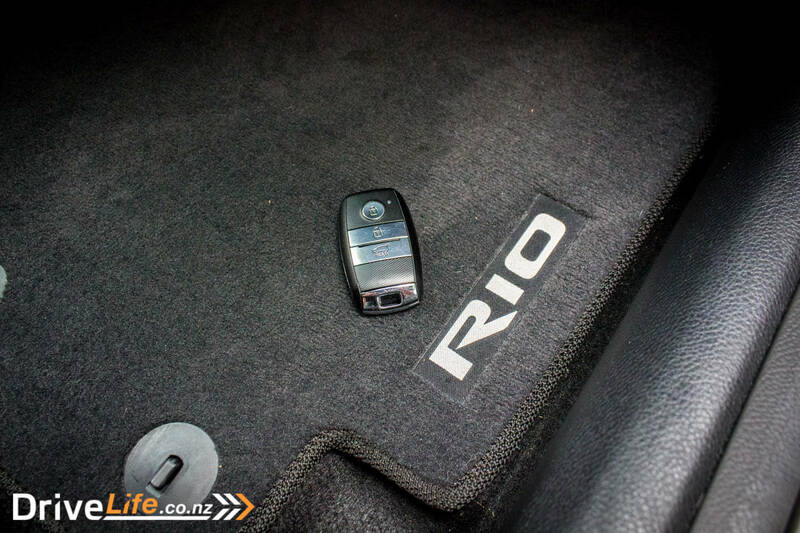 When we tested the Rio Limited back in 2017, the 74kW motor and 4-speed automatic meant it was a car that would struggle everywhere. Not so with the new model – at least in the GT Line version. 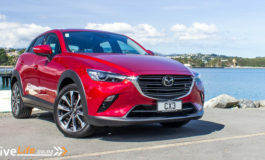 With its 1.0-litre, 3-cylinder turbo-petrol motor and 7-speed automatic, it has the potential to actually match its looks. But – will it deliver? 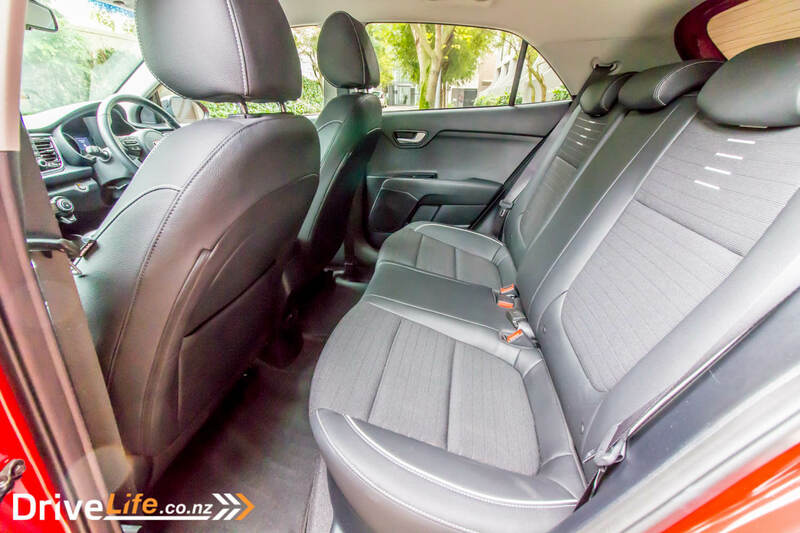 There’s five models to pick from in the Kia Rio range; LX manual ($22,490), LX automatic ($23,490), EX automatic ($25,990), LTD automatic ($26,990), and then the top of the range, GT Line automatic ($28,990). Interesting that the GT line is exactly $1,000 cheaper than the Suzuki Swift Sport auto. All but the GT Line share the same 1.4-litre, 4-cylinder engine from the previous model, with no change in that 74kW power output. At least though that 4-speed automatic gearbox has gone, and in its place is a 6-speed auto. Much better. In the LX manual model, it’s a 6-speed manual ‘box. 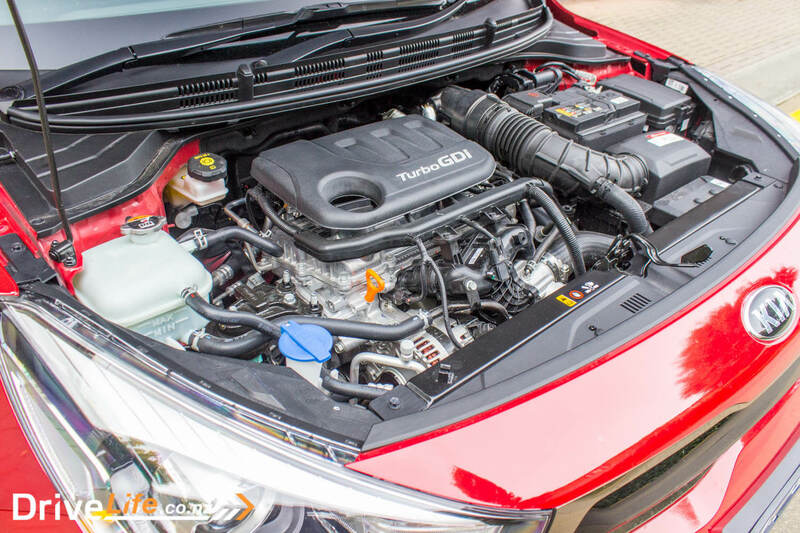 The GT Line does away with the 1.4, and instead has a 1.0-litre, 3-cylinder turbo petrol engine, with just 14kW more power. But the ace up its sleeve is torque; the 1.4 models output 133Nm of torque, and the GT Line bumps this up to 171Nm – extremely respectable for a 1.0-litre engine. Fuel economy for the 1.4s is 5.6 for the manual, and 6.0 for the auto. 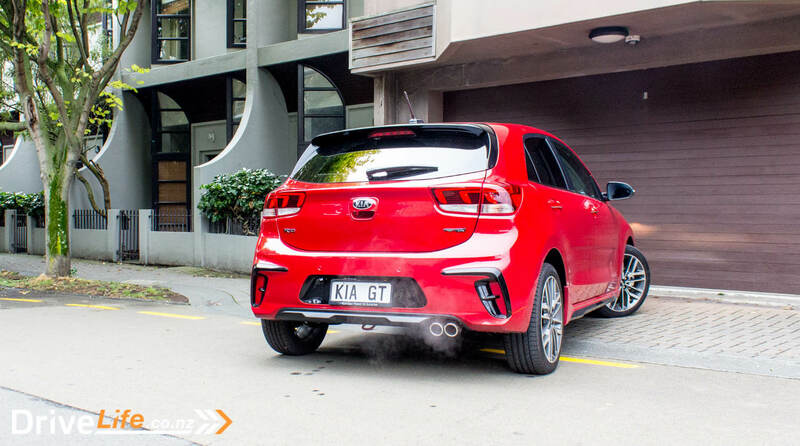 The GT Line should return 5.4L/100km, according to Kia. 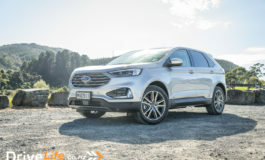 Rims on the base LX are 15” alloys, the EX models move up to 16” and the LTD and GT Line goes one more inch to 17” alloys. 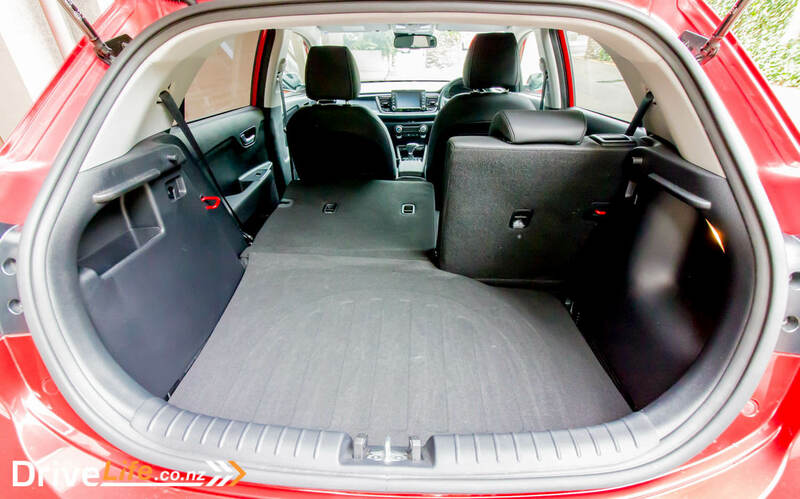 It may be a small car, but there’s still lots of safety assist features, as well as comfort items. 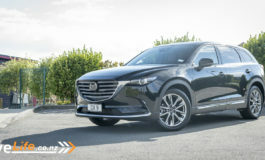 Standard equipment across the range includes Autonomous Emergency Braking, lane keep assist, blind spot detection, hill start assist, remote keyless entry, reversing camera with moving guidelines, leather steering wheel, a 7” colour touchscreen, 6-speaker audio, cruise control, Apple CarPlay and Android Auto, AUX/UB inputs, steering wheel mounted controls for audio and cruise control, aircon, and automatic headlights. If you stump your cash to get the EX model, you’ll also get LED rear taillights, Satnav with SUNA live traffic updates, auto windscreen defog, auto-dipping rear view mirror, auto wipers, and push-button start. The LTD model then adds LED DRLs, automatic headlamp levelling, projector headlights, privacy glass, and alloy pedals. The GT line doesn’t add too much to this, other than the different engine/transmission combo. But you do get Kia’s signature quad LED front fog lights, a roof spoiler, dual exhausts, and a D-shaped steering wheel. Funny that our 2019 test car was finished in the same metallic Signal Red that our 2017 test car was. 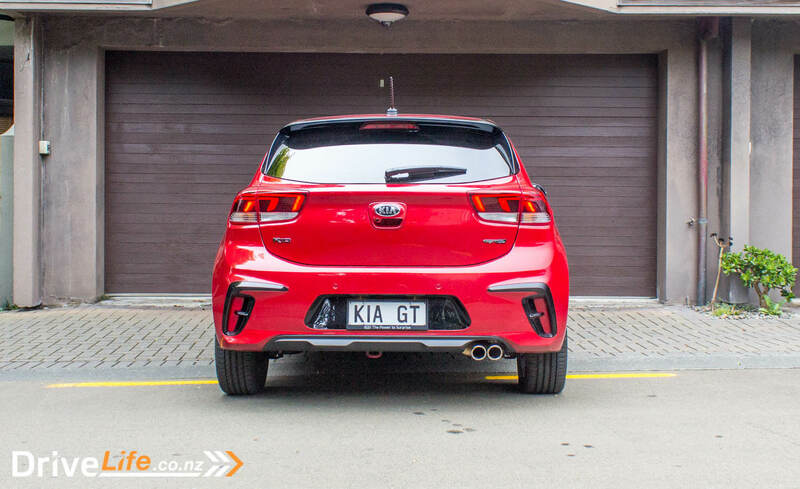 And it looked just as good too, especially at the front with Kia’s signature for the GT Line model – four LED fog lights. They look sporty as hell, and set the front of the car off nicely. For the GT Line, there’s a ‘gloss black and satin chrome tiger nose grille’, a gloss black roof spoiler, and unique 17” alloy wheels. The rear looks a little sporty with dual exhaust tips, and a more rounded design than the previous model. There’s 8 colours to choose from, all of them subdued colours like silver, black, grey. But there is a white, ‘Urban Green’ and a striking Spring Yellow. 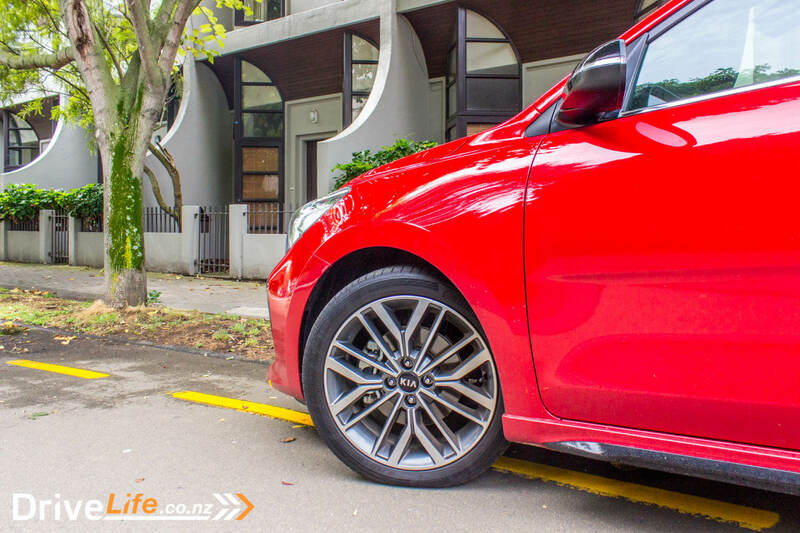 The Rio is definitely one of those cars that suits a brighter colour. 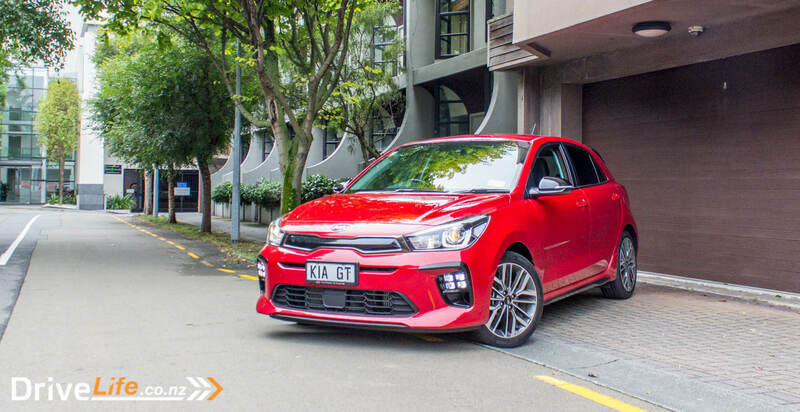 It’s hard to deny the 2019 Kia Rio GT Line isn’t a good-looking car. 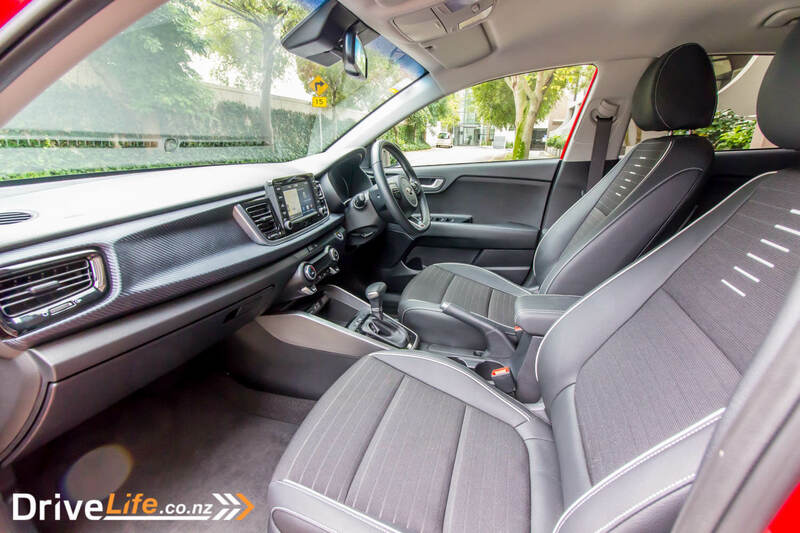 An all-black interior is always a hard sell – but at least the Rio has a beige headlining to lighten up the interior. I expect Kia was going for a sporty look with the all black as well, and from the inside you can see straight away who they are targeting: Suzuki Swift Sport buyers. Nice to see some contrasting stitching on the seats and steering wheel, and there’s also some grey piping on the seats to help break up the black. 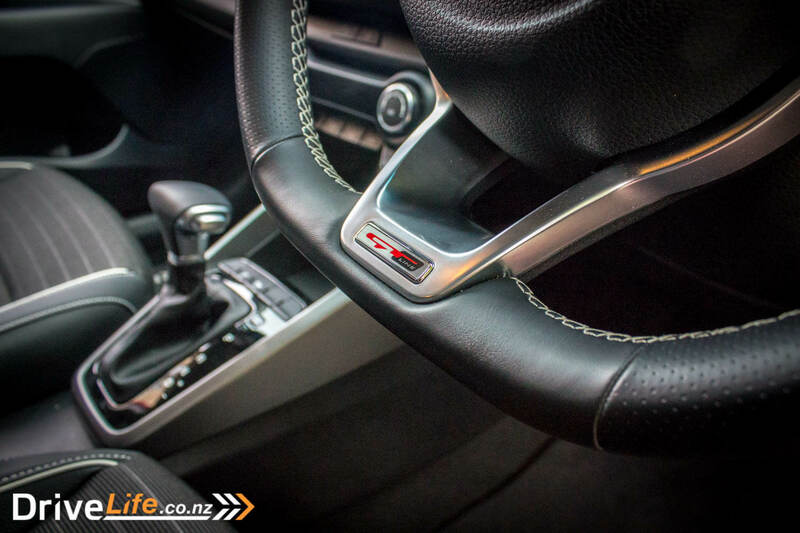 The leather, flat-bottom steering wheel – complete with GT Line logo, and alloy bits – feels nice to the touch, and is just the right size. 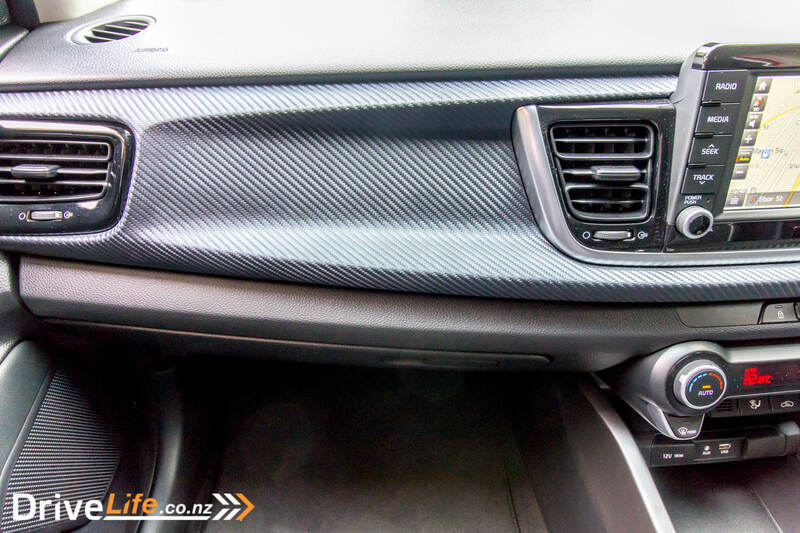 Up on the dash is what I think is supposed to be some carbon fibre, that Kia calls a “carbon-fibre effect finish”. It sort of looks like that, but it does have a textured finish to it. As soon as any passengers get into the Rio GT Line, their hand moves up to have a feel of it. 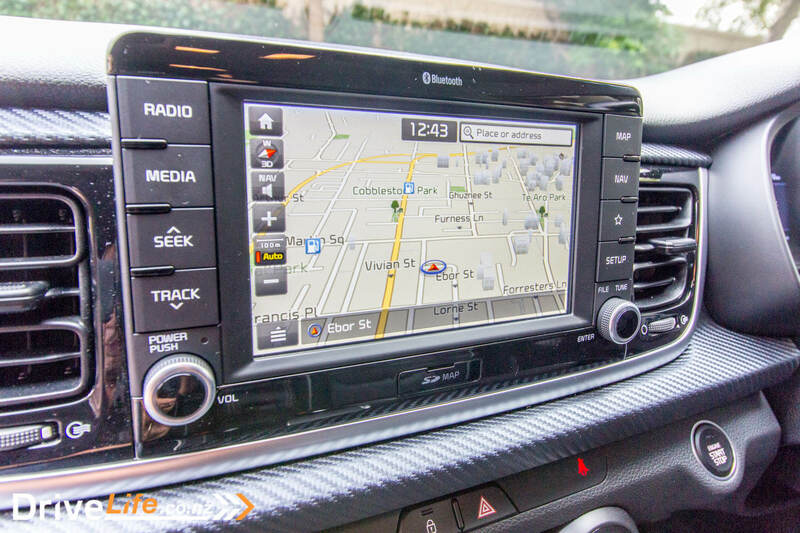 There’s a 7” central display of nice clarity, and again standard Kia infotainment system, complete with SatNav built-in. Also standard is Apple CarPlay and Android Auto, kudos to Kia for making sure these are included. 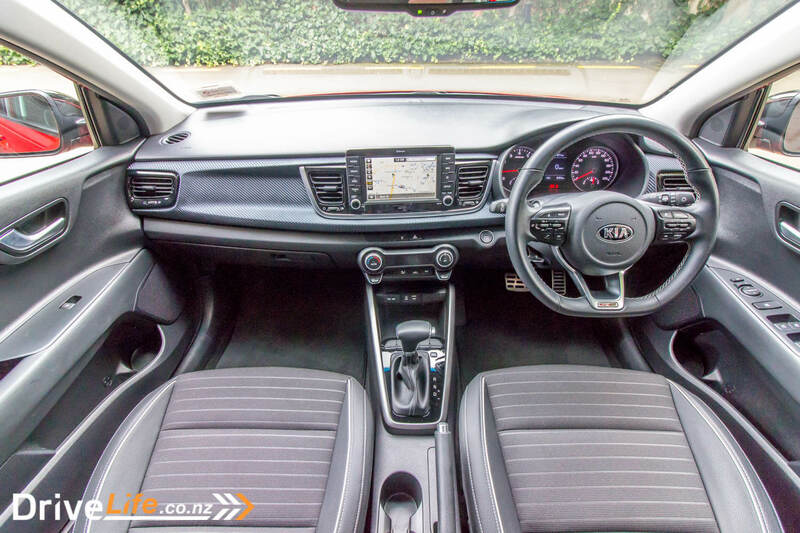 Looking down, no fancy-pants electric handbrake here – Kia have stuck to an old-school manual handbrake, perhaps expecting a few handbrake slides, or just to save money. Still, it’s easy to use, and falls to hand nicely. You get a single front USB and AUX posts up front, the first two things in any car my daughter looks for. For a car under $30K, there’s a good mix of different plastics used, although it borders on just a few too many hard plastics. 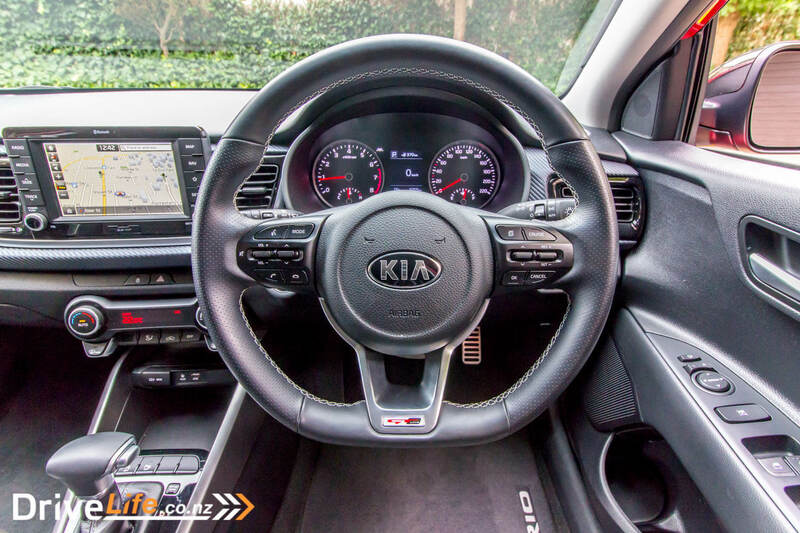 You can see that Kia have had a crack at making the GT Line sporty – the contrasting stitching, the alloy pedals, and the, uh. Actually that’s about it as far as the interior goes. You don’t get red-backed gauges like the Swift Sport, or the in-your-face splashes of red in the cabin. 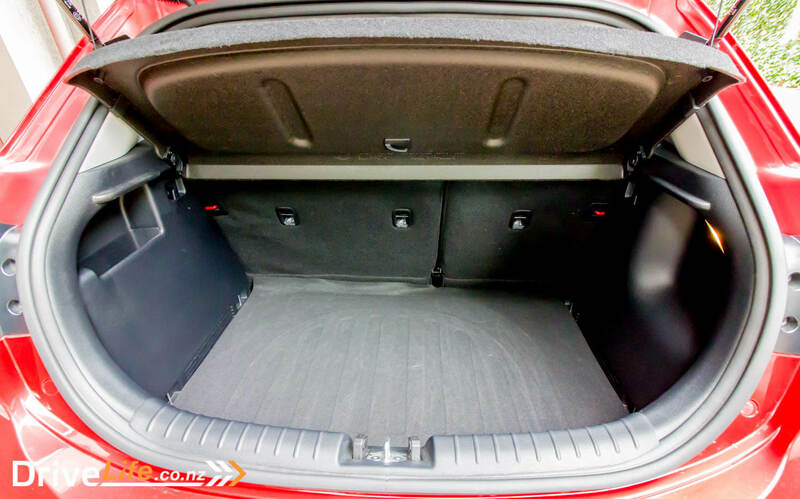 Rear legroom is about right for this class of car, but it’d be tight if you had a tall driver in there. 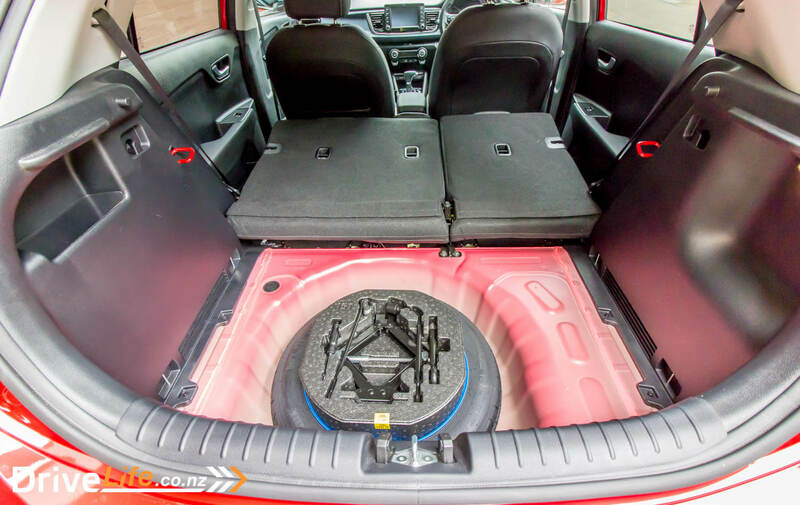 The boot feels big, and is certainly bigger than the Swift, when it’s 325 vs 265 litres. 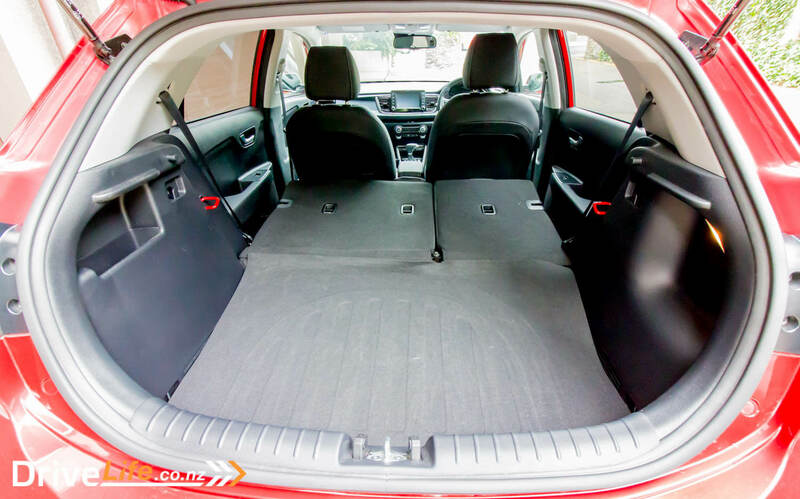 Far bigger too than the 2019 Corolla, with its 208-litre boot space. Instantly, this is a better car than the last one I drove. I still remember my last test Rio – I accelerated (generous term) away from the dealership, and knew it was going to be a slow week. Not so the GT Line – that little, 1.0-litre, three-cylinder turbo motor is as eager as hell, just wanting to go. It’s such a world away from my last Rio experience it’s not funny. It may only have 88kW of power – just 14kW more than the 1.4-litre, 4-cylinder – but it now has 171Nm of torque, up from 133Nm. So, yes – it’s not got a whole lot more power, but it does have a whole lot more torque, and it shows. This is the little engine that could, and matched up (finally) with a 7-speed auto, it can be a great combination. I say ‘can be’, as there are some issues with everyday driveability of the GT Line. To put it nicely, it can be a jerky drive, especially around town. We’re used to some jerkiness in dual-clutch (DCT) automatic gearboxes, and the GT Line is certainly in there with the same problem. The engine – while being so much better than the 74kW version – doesn’t help here, with a lumpy idle at times, and while it can sound nice and rorty like only a 3-cylinder can, it can also be quite vocal. Speaking of vocal, the level of tyre and road noise is on the high side too, and coarse chip seal will see a reasonable amount of noise generated by the Continental tyres. But I do have to give it credit where it’s due, accelerating hard on an onramp will give you some nice engine noise, and on the motorway it’s a serene ride. But it’s the jerkiness I keep coming back to – a good first effort, but needs refining. So that little engine gives the car some credibility to wear a GT badge, but I was confused about the rest of it. There’s no paddle shifters, there’s no Sport mode for the transmission. You do get dual exhaust tips for that GT touch, but there’s not too much else which says it has the right to wear a GT badge. 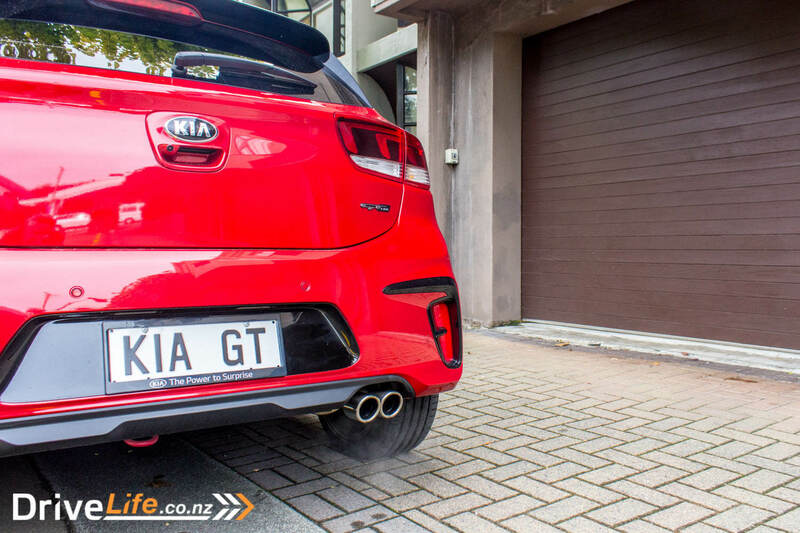 Kia claims this is because it’s not a ‘proper’ GT model, hence “GT Line”. Apparently, it’s for models “that have sporty styling and equipment, rather than true GT performance.” But for most of us, when you stick GT on the badge, it should be a GT. Even though there are no paddles, the shifter falls perfectly to your hand, and has a nice feel to it. There is a manual mode at least, even if there is no Sport mode. On the daily drive, it’s mostly good with generally excellent visibility out of the car, except for a bit of a chunky C pillar, but blind spot monitoring as standard helps here. The ride can be pretty jiggly at low speeds, which can be a little wearing after a while. The suspension itself is quiet, but potholes and other imperfections on the road will be felt. This all feels the same as the previous model. The dashboard is extremely clear and uncluttered, with a big digital speedo right in the middle. 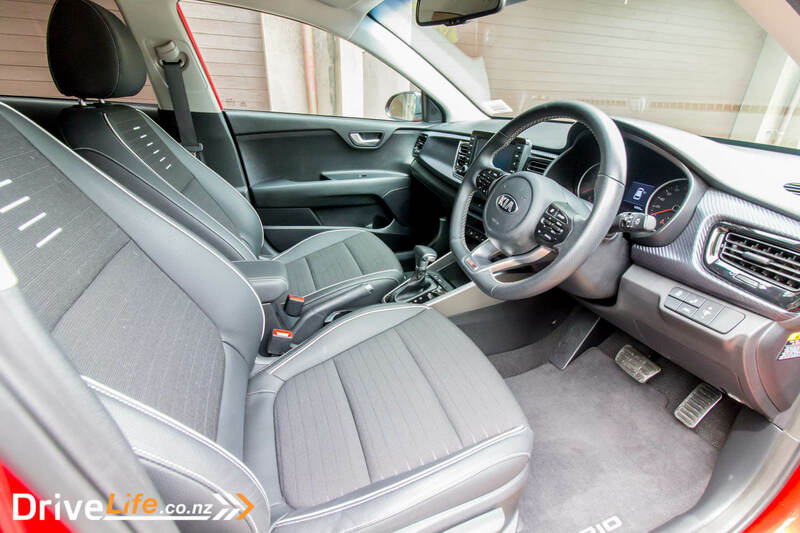 The steering wheel controls are standard Kia fare, and work very well. After a few hours with the Rio, I barely ever looked down at the controls again. Having an up/down control for volume, track/station and speed for the cruise control is how it should be. Speaking of cruise control, there’s no adaptive cruise here, just standard cruise. This is certainly where the Swift (even the mid-spec model has adaptive cruise) and Corolla (standard across the range) have it over the Rio. The infotainment system too is standard Kia, and works simply. I still like how easy Kia makes it easy to be able to split the screen, so you can have SatNav on one side, and audio on the other for example. When using the SatNav, you get nice, big graphics of motorway interchanges and lanes so you know exactly where you need to be. A shame though that the turn-by-turn directions aren’t given in the driver’s information display. The stereo was a revelation for a car at this price point. There’s excellent separation, with clear output at higher frequencies through the tweeters mounted in the A pillars. Thankfully, the Rio reconnects to Bluetooth quickly and automatically when you get back in the car. I see in my review of the previous model this was an issue, so great to see manufacturers listening, and making changes. Fuel economy in a 1-litre car should be good, but add a turbo and it’s going to have some effect on that. Over my 300km in a week, I managed 7.1l/100km. A fair way from Kia’s claim of 5.4, but well over half my driving was city bound, so that’s going to have some bearing on it. 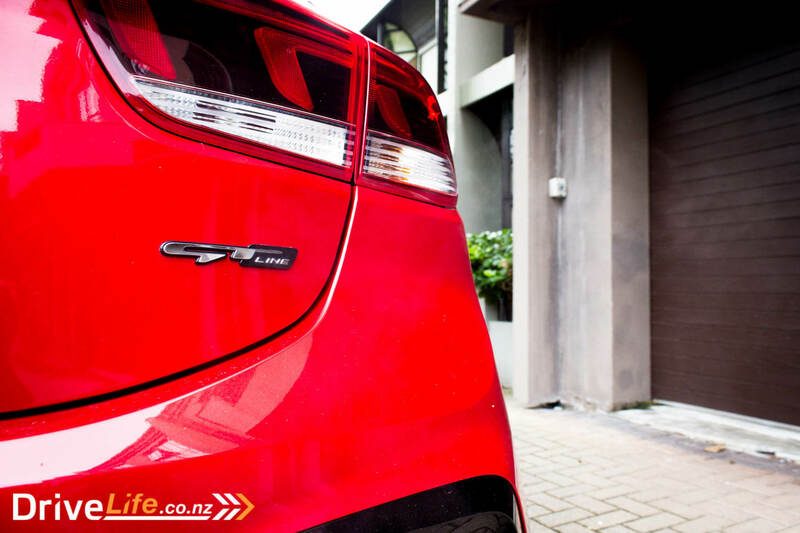 It may cost more, but the Polo GTI with 320Nm of torque is a great benchmark. It’s funny how on paper, you read about a car and believe it’s going to be so good. I found this same scenario with the Kia Soul. I liked the 2.0-litre Soul, but it was fairly slow. Then the Soul Turbo came along and I thought ‘this is it’. But it wasn’t quite as I had expected. It’s the same with the Rio GT Line; great specs on paper, but the coarseness of the engine and the jerkiness of the transmission let it down. It’s still very much a fun drive, and has a lot going for it, but I think I’ll wait for the next new-and-improved version to come out. If Kia can refine this car some, it will have a nice car in its hands.